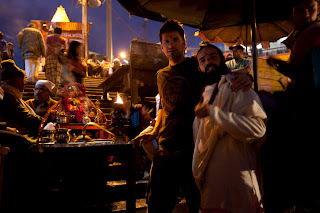 Yogi Vishva and I hanging out in Haridwar during the Shivaratri festival. I've been up to Rishikesh about 5 times now and I absolutely love this place. Nestled in the foothills of the Himlayas, it's known for its incredible scenery, sacred temples, holy babas and escapist hippies from the West. Its also the place where the Beatles hung out and got high enough to write some of their best music. As the Ganges winds it way through the holy city, on either bank one can find saddhus mingling with merchants and crippled beggars hitting up the 'fresh off the boat' hot wannabe Yoga teachers in training. So what brings me here you ask? One of my great friends, Yogi Vishva, has an ashram up here and we're collaborating on a book project currently titled 'Descent.' Its essentially a fine art/photo documentary project depicting Yoga Asana (postures) integrated with the character, soul and culture of life around the Ganges from Rishikesh to the ancient and holy city of Haridwar. I'm not going to say much more but I will say that this project will feature some of my best work. After a very hectic last few months shooting for big advertising clients as well as editorial for magazines...I'm sure happy to be up here. To get a break from stressful shooting, you go .... shooting!